Their Windows Phone endeavors may have not been all smooth sailing for Nokia, but the Finnish company finally came up with the smartphone to beat - the Lumia 1020. Combining the best of both worlds - solid smartphone experience and an unrivaled camera, the Lumia 1020 promises to become the hero device that both Nokia and Microsoft so desperately need at this moment. Nokia has been the king of cameraphones since the golden days of Symbian. The legendary Nokia N95 won our first 5 megapixel shootout, and it was shortly followed by the N82, which added a xenon flash to the mix. Symbian's fate then took a sharp turn for the worse, but even so, the emblematic sharpshooter Nokia N8 came along. Then, at the end of the Symbian era, the 808 PureView arrived and changed our understanding and expectations of cameraphones for good. Unfortunately for the Finns, their WP8 cameraphone voyage didn't begin as smoothly as the Symbian journey ended. The Lumia 800 had an interesting multi-aspect sensor, which sacrificed only little resolution when shooting 16:9 stills, while the Lumia 920 was first to bring optical image stabilization (OIS) to the smartphone world, but neither of those was able to achieve the iconic status of their predecessors. Perhaps adding the PureView moniker to the Lumia 920 in an attempt to capitalize on the brand was a mistake by Nokia, as that guaranteed the smartphone will often be compared to the 808 PureView and that was a battle it was never going to win, OIS or not. 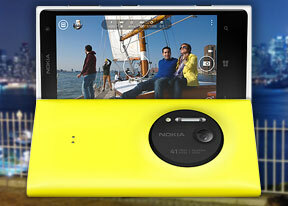 People wanted their 41MP WP8 smartphone and yesterday Nokia finally delivered. The Windows Phone ecosystem is still growing but not fast enough to compete with the big boys. Perhaps bringing the platform to the forefront of the cameraphone race is exactly the kind of push it needed. And camera aside, the Lumia 1020 delivers duly on all those vital other aspects of a modern-day smartphones with barely any compromises made - check out the complete breakdown below. The Nokia Lumia 1020 didn't stay in the factory long enough to get a quad-core chipset or a full HD screen - this kind of WP phones are probably set to arrive further down the road along with the next WP8 release. However, the Lumia 1020 can now make full use of the growing catalog of WP8 apps, which is now not too far behind Android and iOS as far as the most important titles are concerned and is even starting to get an exclusive app now and then. There's also the free lifetime voice-guided navigation that needs no data connection to operate. Getting that on another platform usually costs a pretty penny, so delivering it out of the box is certainly going to earn quite a few points for the Lumia 1020. Then again the new Nokia flagship has quite the price tag to live up to, so it will need all the help it can get. Yesterday, we only got a chance for a quick hands-on after the launch event, but now that we have the Lumia 1020 in the comfort of our office, we are able to make it jump through some hoops and show its real worth. I bought a Nokia Lumia 1020 on Ezeehart Online Shopping. Special discounts for Nokia Lumia models for in this online shopping. In this Nokia Lumia 1020 model was contain the several facilities.